With car-sharing, a company provides a fleet of cars for anyone in a city to use at any time. All you need to do is reserve one whenever you need it, and it’s yours to drive. Of course, this is extremely useful for daily commutes to work or school. These cars have designated spaces in convenient locations. That alone is a huge help because parking in cities is notoriously tough and expensive. It’s also easy on the wallet. The average cost of owning a car is almost $9,000 per year. And in cities, a lot of people are paying their car off without using it much at all. With car-sharing, all you have to do is pay for the gas and a small service fee. There’s no monthly car payments, no maintenance and no parking fees. It’s essentially paying for a taxi, but it’s cheaper and you’re the driver. And you don’t need to worry about not being able to find a cab, because you reserve the car in advance. 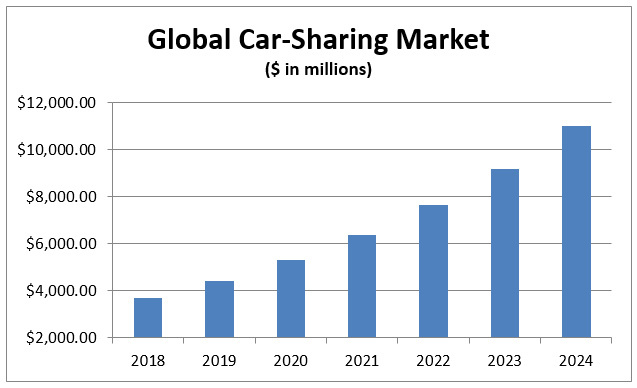 Over the next five to six years, we could see a huge increase in car-sharing, especially in cities. The chart below shows the expected 20% growth per year that the industry is set to face through 2024, when it’s projected to be an $11 billion market. In addition, car-sharing can save businesses money, primarily by not having to pay for as much parking space. And of course, with less cars in a city, overall carbon emissions will be greatly reduced, so governments are on board with this growing market, too. This integration is already happening. For example, cities in the U.K. have begun putting in car-sharing lanes. Germany is a big pioneer in this market as well. Earlier this year, over 2.1 million people had signed up to use car-sharing from 165 providers in 677 different cities and towns. Because this is such a new industry, there aren’t many public companies to invest in yet. But one company that’s heavily invested in car-sharing is General Motors Co. (NYSE: GM). One way it’s invested is by owning a piece of Lyft, which has a commanding lead in the United States car-sharing market. Another is through its subsidiary Maven, which is a car-sharing service offered in 12 cities in the U.S. and Canada. And because of GM’s large outreach and ability to acquire smaller car-sharing services, it’s a good way to invest in this market going forward.